Sometimes you find yourself in a country which is seen a tourism insider tip and you can’t help but wonder why. That’s how DW reporter Kerstin Palzer felt when she visited the country wedged between Europe and Asia. Shorena, our tour guide, has an excellent knowledge of German and bursts with pride for her country. For one week, Shorena traveled with us through eastern Georgia. The coast in western Georgia and the harbor city of Batumi will have to wait for the next visit, which will most assuredly happen. My first impression of Tbilisi was that it’s a surprisingly modern city. Over the past few years new buildings of glass and steel have been constructed throughout the place. Lots of glass – which is supposed to symbolize openness and transparency, Shorena explained, adding that the unrelenting Georgian sun does tend to heat the rooms unbearably. “Pretty, but rather unpractical in our sunny country,” she smiled. 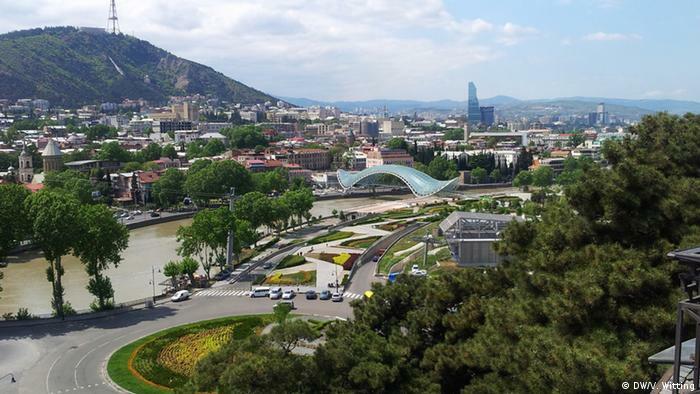 Some 1.2 million people live in Tbilisi. It has narrow alleyways and a very modern cable car, built by Austrians, that connects the center of town with a third-century fortress above the city. 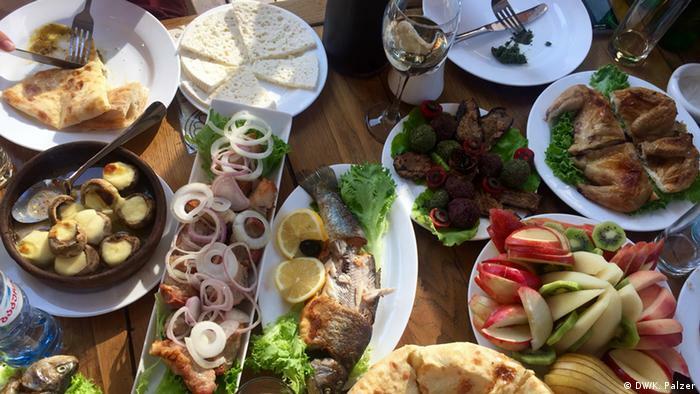 And, very importantly in Georgia, there are excellent restaurants everywhere. On our first night, we ate on a small ship. There was so much to eat that the table wasn’t big enough and plates had to be stacked over each other. Georgian white wine flowed as the sun slowly set, and we sailed on the picturesque Kura River through the old town center of Tbilisi. The next day we headed north towards Mount Kazbek, and the Greater Caucasus Range. The road was a former military route connecting Georgia with Russia – to this day well constructed and maintained. And we were not the only ones who appreciated the road – whole herds of cows pick it as their favorite gathering point. But this is common in Georgia and it didn’t seem to bother neither the drivers nor the cattle. Stepantsminda, a small village at the foot of the big mountains, was rather unspectacular. From here, we had to change to all-terrain-vehicles. On small serpentine roads we drove up to 2,000 meters to the Tsminda Sameba, or Gergeti Trinity Church. A holy place for Georgians, Shorena explained, where centuries ago village elders already ruled and passed judgments. The church is small, dark and during mass you can hardly breathe for all the heat and frankincense. Up here with its perfect view of the 5,000 meter high mountains there is a very spiritual atmosphere. I found myself standing at a holy place in the midst of the majestic surroundings the Greater Caucasus Range with eagles circling above me. This was one of the moments where Georgia charmed me. 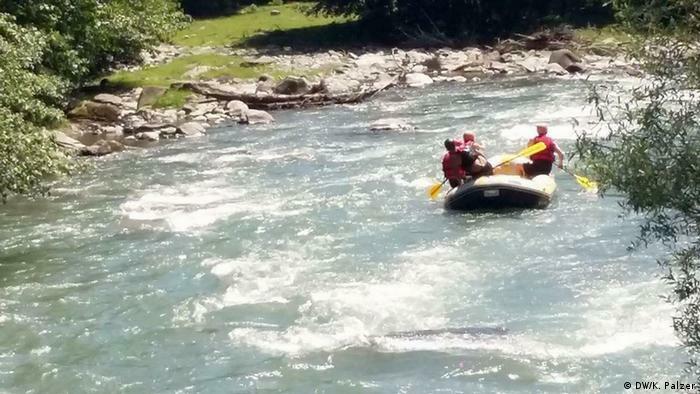 My personal highlight of this trip however was the rafting tour on the Aragvi, a mountain river. Kitted out with helmet, paddles and neoprene wetsuits, we spent an hour and a half on the water. Zura, a young rafting experienced Georgian guided us expertly through the rapids. Some 15 kilometers downstream, we arrived soaked but happy at the base station. And, of course, there was a wonderful meal there waiting for us. Georgia is trying to open up to the West. The main road from Tbilisi airport is actually called “George-W-Bush-Road,” EU flags fly everywhere and younger Georgians in particular speak English very well. Germans can enter the country without a visa. 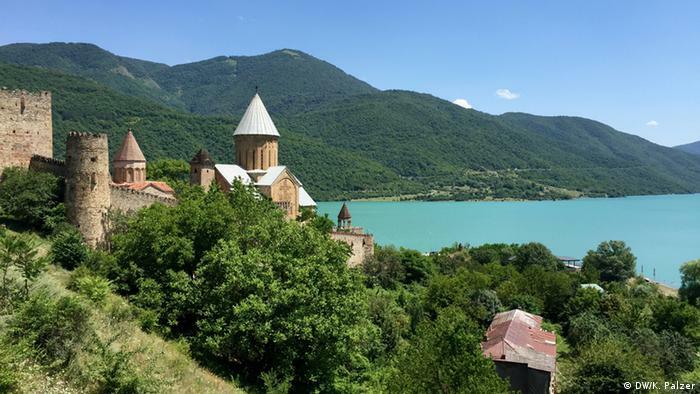 Good hotels can be found virtually everywhere; in Tbilisi and at Mount Kazbek we even had four-star hotels with a high standard of comfort for our overnight stays. 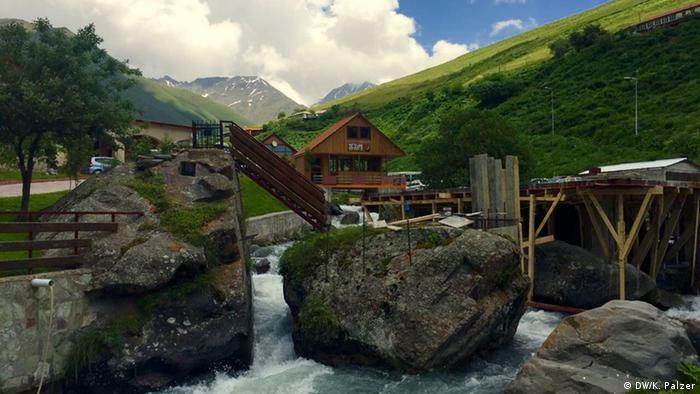 In the Caucasus there are more rustic camps, from which you can set off on some breathtaking mountain tours. In a mountain village we learned how to make traditional Georgian “Khinkali” dumplings.